I like to lead things. As a former high school English teacher, I loved to sit down in the summer and map out my curriculum for the year. Although I had state standards and department guidelines, I had quite a bit of autonomy as far as how I wanted to arrange the texts and teach the content. The decisions about how I wanted to present the information and break down the concepts were very much up to me. And I liked it that way. However, what I didn’t like so much about leadership was the pressure I felt to make the right decisions and the pressure I felt to appease others who critiqued me on the decisions I made. My last year teaching, the week before school began, I developed painful cold sores all of over my tongue. I was that stressed about a new course I was teaching. I did make it through that year — but not without any conflicts. Though my teaching days are past, I am relearning again through heading a ministry that leadership is hard. It brings with it all sorts of problems and conflicts. Part of the reason I felt so much pressure my last year teaching is because I didn’t feel I was adequately skilled to teach that particular course. I felt that any criticism that came would most likely be valid. Similarly, I don’t feel skilled enough to be doing what I am doing now. Because my own self-confidence is so precarious, it can feel extra-debilitating when I get criticism. 1. Sometimes criticism comes even when we’re doing the right thing. As I mentioned in my previous post, David was unfairly criticized by his brother when he brought supplies to the battlefield. His brother confronted him and said, “Why have you come down here? And with whom did you leave those few sheep in the wilderness? I know how wicked your heart is; you came down only to watch the battle” (1 Samuel 17:28). David had been told by his father to go to the battle and had no bad motives. The scene highlights an example that I think will happen to all of us who decide to attempt to lead or put ourselves out there in some capacity: we will get criticized even when we are making the right decisions or do what God told us to do. This idea that sometimes another person brings up a problem “just because” has been very freeing for me personally because I am the type of personality who over-analyzes things and hyperventilates when any sort of issue is brought to my attention: I immediately assume I did something wrong. My mind goes into overdrive, and I start feeling shame and all sorts of horrible feelings even if I made the right choice. My insecurity makes me tend to believe that the people around me and second-guess myself. One thing I found really surprising when I told other people what I felt God called me to in ministry was that some people just did not believe me. I really have no idea why I thought everyone would be on the same page as me (but, I did think that), and I was very confused and rattled when I didn’t feel others’ support. The resistance I felt made me feel like I should just quit. If we are in that place where a spouse, close friend or another acquaintance that we respect does not believe what we are saying, it can make us hesitate and doubt the calling God has given us. However, when God chooses us and calls us for a particular task, He makes it very clear. I had multiple confirmations — through sermons, books I read, prophetic words — and God speaking directly to me. Sure, we need to listen to feedback and advice, but we also need to really look at the place and the person this criticism is coming from. We need to ask God, “What should I be taking away from this conversation?” And just know that although it’s good to listen to others and not put ourselves up on an unreachable pedestal — some criticism we just need to throw out. 2. Sometimes the biggest critic you need to silence is yourself. Shortly after David’s conversation with Eliab, he walked out on the battlefield in shepherd’s clothes, and took the mighty Philistine down with a stone and a slingshot. David’s approach to Goliath was much different than Goliath’s approach to him. While Goliath trusted in his size, his impressive sword, spear, and javelin, David trusted in the Lord (1 Samuel 17:45). David put his confidence not in outward things — but in He who was within him. He was confident that God had equipped him already, and he acted like it. Because I often feel acute self-doubt, the lie that I am often tempted to believe is that I would be better at what I do if I had this trait. Or if I were more like this person. Or if I were more impressive looking. Or if I were like Goliath and respected by everyone. Because as much as I know that I have been equipped to do the work of God, I don’t always feel that way. I fall into a trap of trying to be impressive with my skills rather than in relying on God in all situations. Because of the comments or reactions of a few, I feel extra pressure to “prove” myself. Not only do I feel torn down from the outside, I have a critic inside my head that is louder than the voices outside. In regards to writing for this ministry, I rarely meet my own standards. And it frustrates me. I often write several versions of a post. I tear apart what I’ve written. I worry about choosing the best words and making my articles really amazing. But that is not important to God. It’s vanity, really. If God has given you a message, go and give it to the people as God has given it to you. It is a stupid thing for a man to try to be eloquent. MAKE YOUR MESSAGE AND NOT YOURSELF, the most prominent thing. Set your heart on what God has called you to do, and don’t be so foolish as to let your own difficulties or you own abilities stand in the way. I have to agree. I can get past that critic inside of my head when I make God’s message He wants to convey through me the most important — rather than the way I convey it. God’s servants don’t need impressive displays of skill or might — the One inside of us should be the most impressive thing about us. 3. Sometimes the best reaction to conflict is to wait for God. After David had fought Goliath, he was utilized by King Saul and sent on many more military conquests — and David was successful in every one. So much so, that Saul became jealous of David and wanted to kill him. In one particular scene, David followed Saul out of a cave, cut off a piece of his robe and then thought better of it and refused to retaliate against the murderous Saul (1 Samuel 24:1-21). Softened, Saul’s reaction was to return home. This was not the last time he tried to kill David, but we learn that David’s approach was very wise. He did cut off a piece of Saul’s robe, but he then restrained himself. Although his men urged David to kill Saul right then and there, David did not feel that the Lord had delivered Saul into his hands. Therefore, he chose to use self-control and put the situation in the Lord’s hands. And certainly, his self-control was called upon again as Saul pursued him one more time (1 Samuel 26:1-14). But in both instances, David respected that Saul was the Lord’s anointed and would not put a hand against him. It’s tempting to retaliate when we get in situations where people don’t believe us or come against us. I know I have certainly felt the need to do that and have succumbed at times to launching counter-attacks. However, once more we can learn from David here in his exchange from Saul. David never demanded that people recognize his God-anointing. He just accepted that God had appointed him and didn’t need any other commission. He treated Saul well even when Saul came against him. He was content to wait for God’s timing in his rise to kingship. Not only that — he waited for the Lord’s vindication of his situation. Even though he had ample opportunity to “take matters into his own hands” and get rid of Saul and all of the conflict he caused, he waited instead for the Lord to take care of it. While it can be very hurtful to not have the support we want moving into our ministry or call — and there are times we need to confront or have a discussion with a person, it is essential that we not repay “evil for evil” (Romans 12:17). We should wait for God to move. We should wait even when circumstances seem against us, and it appears that what God has said will not come to pass. Conflict is normal. As Brené Brown notes, we should reserve a chair for our critics in our arena. Rather than hope they don’t show up, we should just expect them to be there. I told God a few years ago that I didn’t think it was “normal” how much conflict was in my life after I said “yes” to following him away from my former career. Not too long after that conversation, I “happened” to open my Bible to the story of Paul. I read about all the churches that had problems with him. Leaders who called him to trial for no other reason than he was testifying about Jesus. Conflicts he had with people just about everywhere he went. None of us should walk around with the attitude of “I am always right and you’re always wrong.” But it is freeing to know that there are times when conflict comes even when we are acting in ways we should. In some cases, we should consider it an indication that we are right where we need to be. Our strength doesn’t come from the support of others or our own abilities — the fact that He has asked us to do what we are doing should give us the confidence to face both critics outside and within. As Brown notes, we may not have a choice about the critics that show up — but we do have a choice as to the criticism we accept. For the longest time, I asked God to give me a ministry. It was driving me crazy when I left teaching that I ended up in a desert season where I didn’t have any sort of project or outlet for my creativity. Once up to my eyeballs in paperwork, lesson planning, meetings, and grading, I found myself staring at a blank schedule when I became a stay-at-home mom. The only things on it were the monotonous tasks associated with mothering my then infant son and toddler daughter. Don’t get me wrong — motherhood is a noble job, and I know that some stay-at-home moms feel called to do just that, but I was itching to get back into the workforce almost the moment I left it. I wanted God to plant me into a ministry and give me another career. I didn’t want to wake up to another day of naptimes and bottle feedings. Another day of living in the same T-shirt and spit-up stained sweats. When it dawned on me that God wanted me to start my own ministry blog (a prospect that scared the heck out of me), I found it to be way harder that I thought it would be. Most days I tell Him that someone else could do a better job. There are people who are better writers, better speakers, better administrators. People who know about SEO and WordPress plugins and social media. People who know more about blogging and write posts with no anxiety whatsoever. People who don’t have to potty-train reluctant little boys while trying to simultaneously revise paragraphs and look up commentary for verses. But I keep coming back to the same idea that God chose me for this. 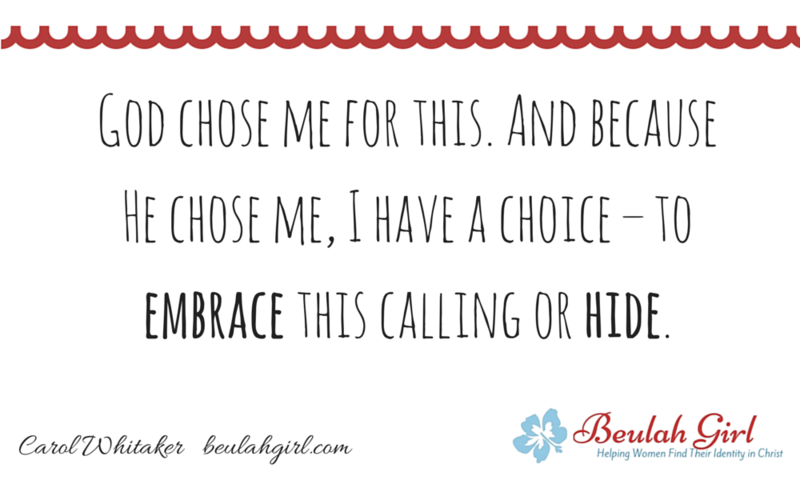 And because He chose me, I have a choice — to embrace this calling or hide. When I get conflict-ridden emails to answer, look at ways to grow the ministry and then look at my lack of funds and know-how, stare at blank paper asking God what I need to say in a meeting, I sometimes want to run away. The bottom line is I don’t feel like a good-enough, equipped-enough leader. I’m barely surviving most days. But a story that has inspired me lately is the one of David because he was the least likely on the planet to lead Israel, but he is the one God chose. 1. Good leaders get their confidence from God’s acceptance of them. David was the least significant of all the brothers in his family. He was out tending sheep when Samuel stopped by to anoint the next king. No one in his family saw that he had the potential to be the next great king, but God did. Surprisingly, David didn’t seem put off by the fact that no one in his family believed he was fit for leadership. He seemed to just take the anointing in stride and then go back to tending sheep. He accepted the Lord’s promotion of him even when no one else other than Samuel believed him equipped for the job. Similarly, when Mary learned from the angel that she would become pregnant with child, she accepted the Lord’s assignment in bearing Jesus (granted, she didn’t have much choice as to what happened inside of her body), but she did have a choice as to her attitude towards the situation. She said “yes” to God with these words: “I am the Lord’s servant. May everything you have said about me come true” (Luke 1:38 — NLT). I’d love to say that I have been as accepting as David and Mary of the Lord’s assignment for me, but I haven’t. I’ve wanted the assignment to be different. I’ve asked Him not to make me write about the parts of my story I don’t want to share. And I’ve wanted others to see immediately the calling He has had for me. But what I can learn from David and Mary is that God calls things before they are (Romans 4:17 — NKJV). I need to accept what He has said of me because He has said it. 2. Good leaders don’t let others derail them from their God-appointed task. 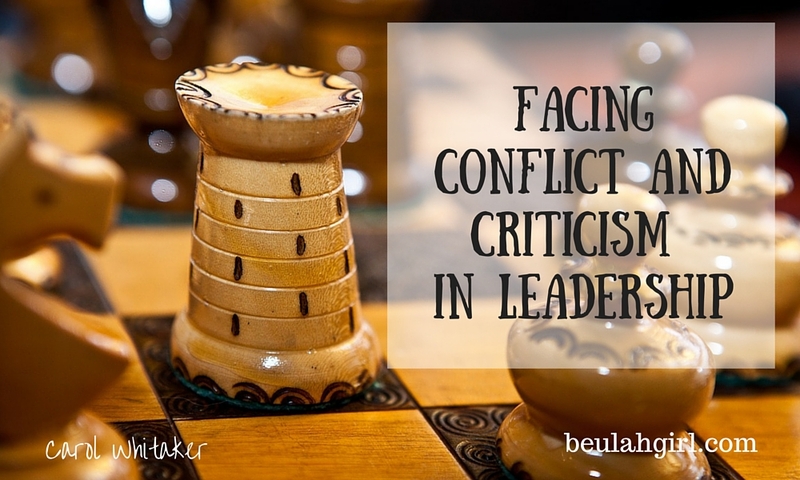 A few years ago, when I was begging God to let me do something for Him, I had forgotten all the conflict and opposition that comes with leadership. Leaders have to make decisions that are not always well-received or popular. As you may have guessed from my last point, I like people to understand me. Because of this, I feel inside a need to defend myself, to justify my actions when people don’t agree with me, but another leadership quality I can learn from David is that he didn’t allow the misunderstanding of others to derail him. We see in David’s story after he was anointed king that he was instructed by his father to bring supplies to the battlefield. (Yes, David still lived at home for a time even after he was anointed king.) The Israelites were fighting the Philistines, and David did as his father instructed and brought cheese and bread to the battle lines. His older brother, perhaps a bit peeved about David’s recent anointing, said, “Why have you come down here? And with whom did you leave those few sheep in the wilderness? I know how conceited you are and how wicked your heart is; you came down here only to watch the battle” (1 Samuel 17:28). Talk about major injustice! Major misunderstanding! David had been told to go by his father. He had no ill motives, yet his brother assumed he did. David, seeing right through his brother’s jealousy, responded: “Now what have I done? Can’t I even speak?” (v. 29). By his words, we see his rejection of Eliab’s critique. Because, as the Reformation Study Bible points out, Eliab’s words contradicted what God had already said about David. Note, earlier, God defined David as a person after His own heart (1 Samuel 13:14). And, when Samuel anointed David, God made it clear that He looks not at what man looks at but the heart (1 Samuel 16:7). And He clearly found David’s pleasing. David wisely chose not to allow his brother’s cut-down to change his mind about who God had called him to be. In fact, right after this conversation, David went and asked Saul if he could go out and fight Goliath. As it turns out, David had a Goliath in his own family to conquer before he ever made it to the battlefield. Those that undertake great and public services must not think it strange if they be discountenanced and opposed by those from whom they had reason to expect support and assistance; but must humbly go on with their work, in the face not only of their enemies’ threats, but of their friends’ slights and suspicions. I have not been like David in my own transition into leadership. The second that criticism comes, self-doubt and insecurity set in. The solid rock I feel myself standing on feels shaky, crumbling. Maybe I am not the person for this job. What if I fail? Did God really tell me to start this? Maybe others are right. I need to quit. I can’t do this anymore. When moments like these come, my mind races. And I feel panic and anxiety. God, don’t make me do this any longer! But God, through the story of David, has been reassuring me to not give up. To keep going and see myself as a leader because He has said it is so. The only person that needs to accept that other than Him is me. I have to believe it for myself. David models for us how to not allow others’ voices to drown out God’s calling on our lives. It’s good to listen to feedback and gain advice, but not if the advice counters what God has said is so. 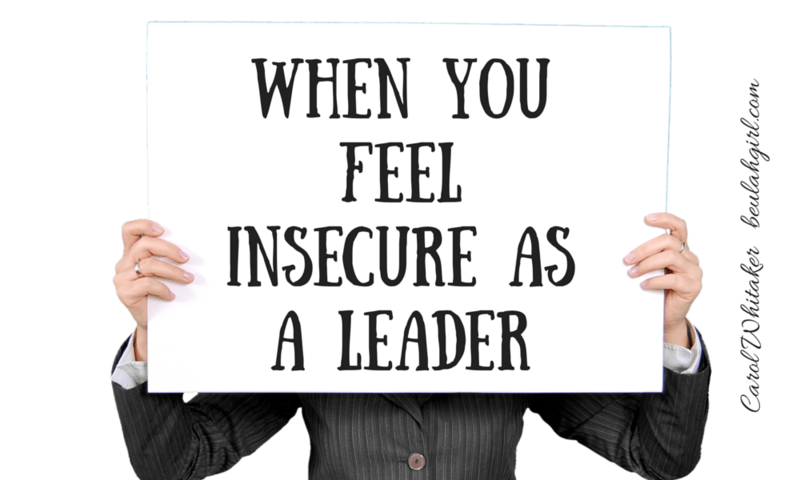 It’s easy to lose confidence as a leader based on what others believe or say about us unless we continually keep in view the foundation of our confidence: Him. I haven’t lost my fear or insecurity in this process, but I’m making the decision to ask God for strength to face my Goliaths and depend on Him when I don’t feel like I can possibly do what He has asked of me. What about you? Has God called you into a position that feels a little too big for you, and you feel like maybe your heard Him wrong? Tell us in the comment box below about a struggle or leadership problem you are facing.